Whoa, two posts in one day?! Crazytalk! I stumbled across www.alltheweigh.com the other day and noticed that she does this cool survey every monday called "Friend Making Monday" where bloggers sill out and post the survey on their blog then link it in the comment section of All the Weigh. It's a good way to connect with new blogs and bloggers. This week's theme was a little tough for me as I'm pretty new to blogging, but I thought I would give it a shot anyway. 1. Have you ever met anyone through your blog that led to an in-person friendship/relationship? I haven't yet, but I'm certainly not opposed to it! There are so many awsome bloggers (and readers!) out there that seem like great people and I would be thrilled to meet them. 3. If you could meet three bloggers, who would they be? That's a tough one! I could name a handful that I would love to meet one day, but one in particular would be Katie from Runs for Cookies. Hers was one of the first blogs that I started following and her story is very motivating! 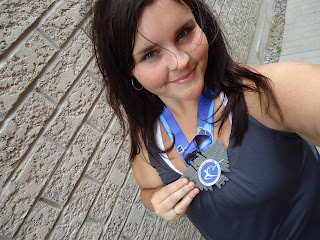 I'm not sure if I would've started blogging or running if it wasn't for her blog! 5. Do you vlog (video blog?) I haven't done a vlog and I never really considered it. I personally don't really like watching vlogs, but I've heard that some people love them. Perhaps one is in my future! 6. How many blogs do you read on an average day? It varies, but it probably averages around 10-12 a day. 7. What is the coolest thing that you’ve seen online recently? Andie at "Can You Stay for dinner?" posted a link to an article called "Hey, Fat Gir" recently and it really hit home! I would reccomend reading it. 9. Have you ever attended a blog conference like Fitbloggin? If not, would you? I haven't, but I would love to! I've been hearing so much about Fitbloggin and I'm so jealous of all the people going - it sounds like a great time! 10. In the past I have asked why you blog. Now I want to know why you read blogs? What do you take from it? 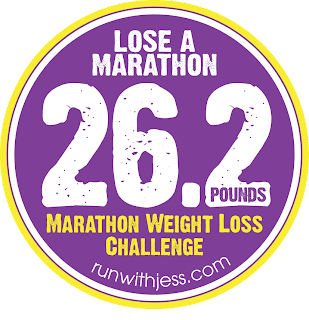 I read blogs to stay motivated in my weight loss journey. I love reading about other peoples success and it's great to relate to others who are not only succeeding, but struggling. Anyone is welcome to participate in "Friend Making Monday". I really liked that "Hey, Fat Girl" post as well. Inspirational! I just found your blog from FMM. It's great! I can already see a real difference in your pictures. And, I love the mini-goal rewards. I'll have to check out some of the blogs you mentioned; I haven't read most of them. If you ever have the chance to meet a blog friend - do it! I loved Hey Fat Girl too! I follow some bloggers from Canada. I could round them up for you and send them if you would like! Cheers! Sabrina, stopping by from FMM! I am "out" to my friends and family. That is what holds me back from posting my weight and measurements on my blog. I don't think I would be as embarrassed letting the wonderful blogging community know my true weight but to have them know...scary for sure! I read that post too (Hey Fatgirl) and WOW! Gives everything a new perspective. Also, now that I read your replies to other comments.. Your Canadian? Nice, me too! That I am! I haven't come across to many so it's nice to meet one!